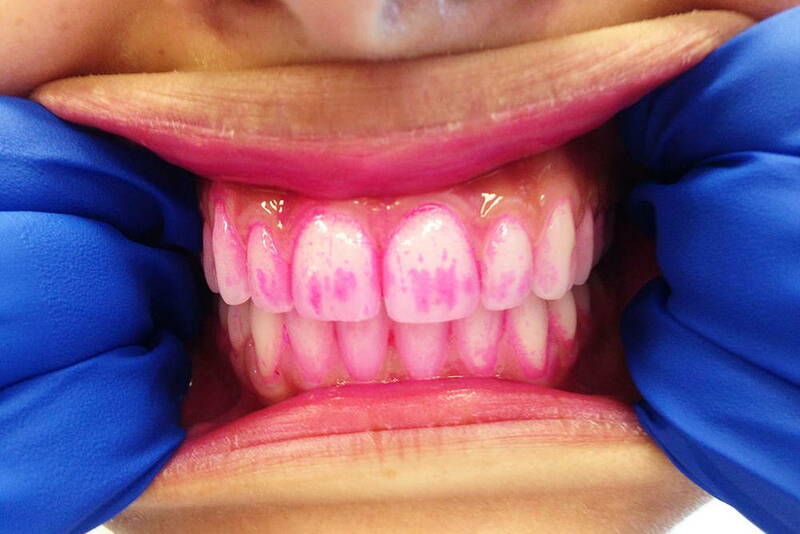 Almost everyone has had dental tartar cleaned, and you all know what that looks like. A majority of people also think this issue is only an esthetic flaw because it makes their teeth darker. However, the outer surface of a tooth also gets darker due to staining by pigments from food, drinks (wine, coffee), and this is most pronounced in smokers. In addition to the esthetic problem, it’s much more important to know that tartar can cause the inflammation of gums (gingival tissue) and deeper supporting structures of the tooth (peridontium). So let’s start from the beginning, in order to find out what dental tartar is and how it appears. Dental plaque is a basis for appearance of dental tartar. Plaque is a very thin layer of bacteria and food remains, invisible to the eye, located on the surface of the tooth. It is possible to remove it only through mechanical cleaning (e.g. with a toothbrush). Plaque is more abundant and it appears to form more easily in people that eat soft and sticky food like sweets, white bread and chocolate. In contrast to that, hard and raw food like black bread, raw fruit and vegetables lower the formation of plaque thanks to its consistency and also through the mechanical effect of chewing. Plaque also forms more easily on the surfaces that are hard to clean (i.e. the places that the toothbrush can’t reach). Plaque matures through several days and changes its composition. As an example I would point out, that a six-days-old plaque contains around 100-300 million microorganisms per milligram of weight. Quite a sizeable number!! As expected, this amount of bacteria quickly causes an inflammation of gums. As an attempt to defend itself from such a surge of bacteria, our body starts a process of plaque calcification which results in the appearance of dental tartar. There are several theories how this occurs, but the common line in all of them is that this results in depositing of mineral into the plaque. This defense attempt isn’t efficient at all, since it creates a rough and coarse surface that makes it even easier for bacteria to stick and in that way amplify the inflammation of gingiva and peridontium. There are two types of tartar, different by its composition and the place where it occurs. One type is the dental tartar that occurs above the level of the gums, usually on the surfaces of the tooth that stand opposite to the exit of the salivary glands. That includes the inner part of lower front teeth and the outer part of the upper molars. Dental tartar that occurs this way is white-yellow in color. It can also occur on other surfaces that are suitable for plaque formation, so it’s not rare to find it on dental prostheses’. Other type is the dental tartar that forms under the surface of the gums. It’s usually dark brown or green-black and it sticks very tightly to the surface of the dental root, which makes it harder to clean than the first type. This type of tartar is related to chronic inflammation processes of the peridontium. You can suspect this to be the case, if the edges of your gums aren’t light pink but dark and gray which is a result of tartar forming along the gingiva. Finally I would like to remind you that there is no dental tartar without the plaque and there is no plaque if we take good care of our oral hygiene (brushing teeth, using interdental brushes), so its prevention remains your responsibility.